I like the concept, but how are you going to evolve each when they raise the tradeskill cap and add more to tradeskills? 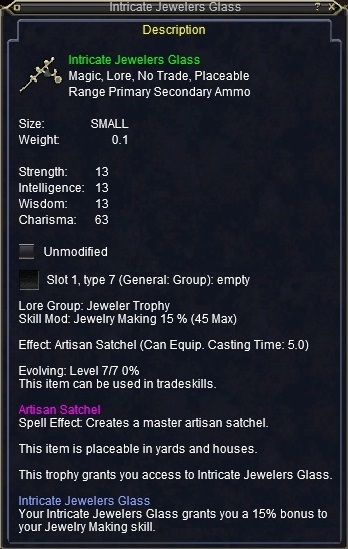 I guess the stats of each skill/trophy evolution would be specific to the stat on the trophy, but I think Master Artisan Trophy is a rather generic name for such a wonderful thing to have. Evolving it to Grand Master... would be a status far greater than almost anything if you are a tradeskiller. The stats would be nice if they were all combined, sort of like using infusion to combine stuff that really counts so that you could easily max all your stats, or even boost beyond the cap, (I suppose it would be fair to make this zone specific to almost anywhere you can do tradeskills in a static or instanced zone with containers). I got this Trophy by accident really if you can believe that. I actually have no interest in cutting stones or making rings and whatnot. I only wanted to do tailoring. But, for me the best path for tailoring was the buried sea sunshard pieces. And that means doing two jewelry combines for every tailoring combine in order to make the Spun cloth and Fitted leather armors. I just happened to check my jeweler's trophy one day and noticed that it was at 15%. So if you are hurting to get your jewelcraft up, just do sunshard tailoring components hehe. #2 is apprentice jeweler Trophy.